How is an ASD closed using a catheter-based procedure? 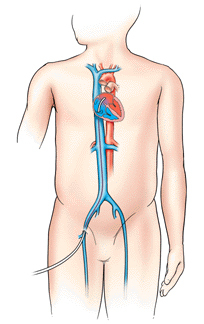 Catheter-based procedures are commonly used to diagnose and treat heart-related problems. For example, catheter-based procedures are used to diagnose and treat clogged arteries and heart attacks. A catheter can also be used to guide the placement of an ASD device - which becomes a permanent implant - that will close the hole in the heart wall. To further briefly explain what happens in an ASD catheter-based procedure, a cardiac catheterization involves slowly moving a catheter (a long, thin, flexible, hollow tube) into the heart. The catheter is initially inserted into a large vein through a small incision made usually in the inner thigh (groin area) and then is advanced to and into the heart. One or more tests will be done to measure the ASD and to be sure there are no other defects. An imaging test called angiography, (an injection of a certain type of dye followed by an x-ray motion picture) may be used to better visualize the heart. An ultrasound imaging technique, to see the defect better and also to determine the size of the closure device needed, may be used. One technique, intracardiac echo (ICE), involves passing an imaging device up to the heart through the vein in the patient’s other leg. Another technique uses an ultrasound probe passed down the esophagus (transesophageal echo, or TEE) to allow your doctor to see the heart structures and blood flow as the device is being placed. In addition, a special balloon on a catheter is moved to the area of the hole and inflated across the hole in order to measure the size of the hole when it is gently stretched. The cardiac catheterization procedure for an ASD closure typically takes 1 to 2 hours to complete. A local anesthetic is used to numb the groin area where the catheter was inserted. Use of general anesthesia or sedation by IV is situation dependent -- depending on doctor preference and particular patient needs. What types of ASD closure devices are there? Two main types of ASD closure devices are currently being used at the We Care India partner hospitals - the Amplatzer® Septal Occluder System and the HELEX® Septal Occluder. 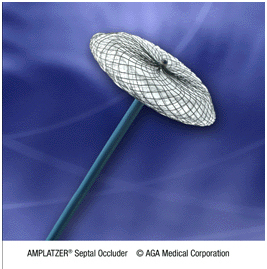 The Amplatzer® Septal Occluder consists of a two attached circular discs - a larger disc, which will reside facing the left atrium, sandwiched on top of a smaller disc, which will face the right atrium. These discs are made of polyester fabric encased by a wire mesh made of a nickel-titanium metal alloy. The HELEX® Septal Occluder consists of a circular wire frame made of a nickel-titanium metal alloy covered with a thin membrane made of Gore-Tex, a material that has been used in open-heart surgery for more than 20 years. Once the device is passed through the catheter it opens up to form one circular disk that covers the hole on the left side and one disc on the right side of the septum. How does the body react to a permanent implant? The materials used in the occluders have a proven long-term safety history and have been widely used in heart surgery procedures. It’s not likely that the body will have a negative reaction to these devices. Within a few days, the body’s own tissue will begin to grow over the device. By 3 to 6 months, the device is completely covered by heart tissue and at that point becomes a part of the wall of the patient’s heart. The patient will not be able to feel the device. The implant will not be affected by airport or other security sensors, or by any household appliances, or medical imaging methods. However, the clarity of MRI or CT images may be slightly reduced because of the wire frame on the occluder devices. For this reason, be sure to inform the imaging technician that you or your child has such a device in your heart. You will receive an identification card that should be carried with you/or by your child to show to medical personnel if necessary. Can a catheter-based ASD closure procedure be used in all cases? If your ASD cannot be closed with a catheter-based procedure, your doctor will discuss other treatment options including open-heart surgery. How does an open-heart surgical procedure compare with a catheter-based procedure? The catheter-based procedure for ASD closure usually results in a much shorter hospital stay (typically 6 to 24 hours), reduced scarring (limited to the leg area where the catheter is inserted) and an easier, more rapid recovery. With open-heart surgery, an incision is made in the chest to expose the heart. A heart-lung bypass machine is used to pump blood for the heart while the heart is stopped and the wall defect is being repaired. The defect is closed by sewing a patch in place (if the defect is large) or by stitches (if the defect is small). Surgical patients usually stay overnight in the intensive care unit and then 3 to 5 days in the hospital and about 4 weeks of additional recovery time is necessary at home. Open-heart surgery results in a scar on the chest but may be the best or only option in some cases. Your doctor will discuss these two treatment alternatives with you in order to make the best decision for you or your child. What follow-up tests and home care instructions are typically given following a catheter-based procedure for ASD closure? Within 24 hours after the procedure, a chest x-ray, electrocardiogram, and echocardiogram are conducted to make sure that the device is positioned correctly. Bed rest in the hospital for 6 hours after device placement is required. The patient may go home the evening of the procedure or possibly the following morning. The patient may experience minor pain at the catheter incision site and a slight sore throat for a few days if an ultrasound probe was used to check device placement. The patient will be instructed not to lift anything greater than 10 pounds for 1 week after the procedure. Your doctor will discuss when you or your child can return to regular activity (usually within a week). Your doctor will prescribe medications that will need to be taken at home. Aspirin or other blood-thinning drug will need to be taken daily for 6 months or longer to prevent blood clots from forming. Antibiotics will also need to be taken 1 hour before certain medical procedures (for example, dental cleaning/dental surgical procedures as well as certain surgeries) for up to 1 year post device placement. Your doctor will provide information on which procedures will require antibiotic pre-treatment. As with all medications, take them only as directed by your doctor, never stop taking the medication without talking with your doctor first, and call your doctor if you experience unpleasant reactions or have any concerns about the medication. Finally, a few follow-up return trips to the hospital will be necessary over the next year to monitor the patient’s heart and device placement. Each visit -- at 1 month, 6 months, and 1 year -- will include a chest x-ray, electrocardiogram, and echocardiogram.